Because countries’ commitments are not enough, and cities, local governments and businesses can only do so much to keep climate impacts from reaching the most dangerous levels, we need to strengthen the mutually reinforcing relationship between national and subnational climate action to support and unlock greater ambition. To show how this relationship between cities and national governments can work, let’s start at the top: Bogotá, Colombia, one of the most high-altitude capitals on Earth. At 8,600 feet above sea level, high on an Andean plateau, Bogotá is Colombia’s largest city with a population of 8 million. Its location has benefits, like abundant, year-round fresh water trickling down from moorlands and a relatively consistent cool year-round climate. These traits should make energy demands for Bogotá’s buildings relatively low and straightforward compared with to its South American neighbors. That’s a good thing, since Colombia’s buildings produce roughly 45 percent of national emissions, so reducing building energy use is central to meeting its international climate commitments. But when Bogotá tried to implement building codes that were passed by the national government in 2015, the city found the policy lacked essential elements like guidance on where to set the baseline for energy efficiency. In 2016, through the global Building Efficiency Accelerator (BEA), Bogotá committed publicly to implement a building energy code in city regulation and district plans. Within only six months of this commitment, city officials had held a launch workshop, won official support from multiple city departments and presented their 18-month work plan. By summer 2017, they had discovered the national codes’ shortcomings. The timing was particularly crucial due to the city’s breakneck pace of growth. By 2050, Bogotá plans to more than double its number of homes, from 2.3 million now to a total of 5 million and is already developing a new master plan that will determine how it will grow over the next 12 years. Mayor Enrique Peñalosa made it clear that this growth can’t come at a cost of doubling energy demand on its grid or polluting its air. So, he sought a compromise. Together with BEA’s Colombian partner, Consejo Colombiano de Construcción Sostenible (CCCS), Bogotá city officials used the Building Efficiency Accelerator to contact the U.S.-based Pacific Northwest National Laboratory, which proved crucial to understanding how to best revise and implement the Colombian building code. Experts at the laboratory, which has evaluated building energy codes from multiple countries, were able to offer options for making Colombia’s legislation more realistic. Bogotá then enlisted local university researchers, utility executives and construction leaders to simulate how revising the legislation could make it more workable by the local construction sector. Informed by the results of technical and stakeholder analyses, Bogotá city staff, CCCS and the BEA created a protocol that made the national building code something Bogotá and other large Colombian cities could properly put in practice. That in turn enabled the mayor to commit to implementing the national code throughout the city’s master plan for urban redevelopment. Building from its experience with Bogotá, CCCS then held several roundtables with the Colombian National Planning Department to inform national policy on sustainable buildings. In March 2018, the summary white paper was approved by the president and his cabinet, much to the delight of CCCS, Bogotá and their far-flung friends throughout the BEA network. 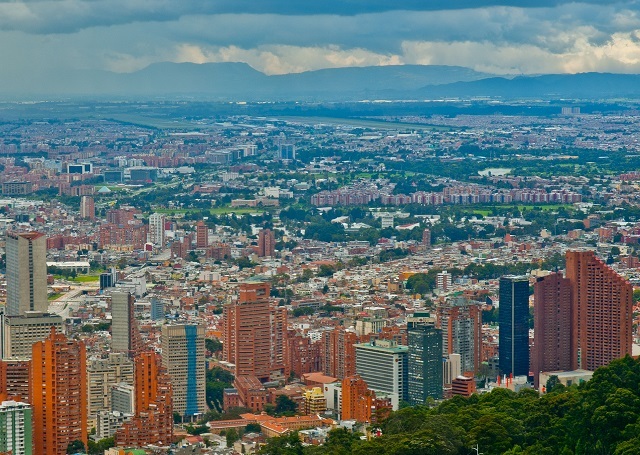 On October 3, Bogotá announced its new policy for more energy-efficient construction, integrating the now implementable national building efficiency code into their master plan. The policy is expected to reduce energy and water use in new buildings by 20 percent and 30 percent, respectively. “Through the BEA, we have a unique opportunity to extend Bogotá’s positive impact to other cities in Colombia, in collaboration with the Ministry of Housing and the more than 25 stakeholders that participate in the program,” said Sarah Arboleda of Consejo Colombiano de Construcción Sostenible, Colombia’s Green Building Council. From the dizzying altitudes of Bogotá to the president’s desk, and then out to all the cities of Colombia, this case demonstrates the sort of virtuous interdependency that is feasible between cities and their central governments – and what’s desperately needed to achieve climate action at the national and global scale. This post is part of a series on how virtuous interdependency brings greater climate action when national governments and regional, state and local governments and businesses work together. Shannon Hilsey Choy is a Project Associate for the Building Efficiency Initiative at WRI Ross Center for Sustainable Cities. Cristina Gamboa is the interim CEO of the World Green Building Council.